We love an excuse to eat pancakes and what better excuse to do so than on Shrove Tuesday AKA Pancake Tuesday. 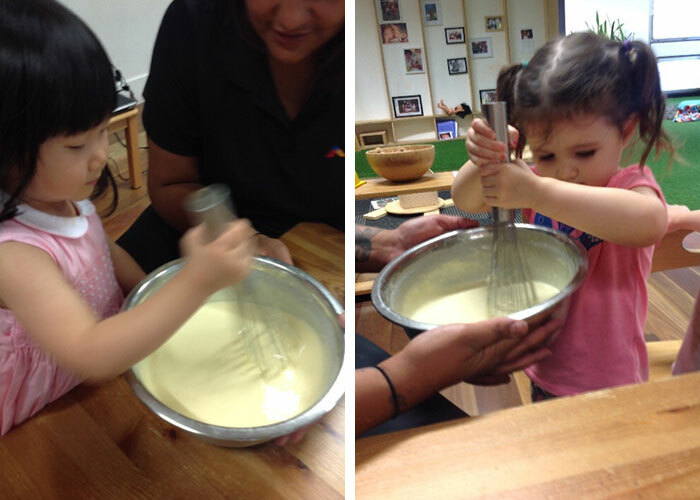 Educator, Lisa Colcannon, and the children at Martin Place Early Learning Centre celebrated the day by having conversations with the children about pancakes, the history of Shrove Tuesday and, most deliciously, make pancakes! Using this information and sharing it with the children is another way we engage in cultural diversity and customs that people may or may not partake in. To prepare for Pancake Tuesday, “yesterday we listened to a story about the runaway pancake as well as watching a video of a young boy making pancake batter before flipping it,” said Lisa. The children helped to mix the pancake batter. When Pancake Tuesday arrived, the children helped Vanessa, the centre cook, by making the batter for her so she could prepare the pancakes for afternoon tea. Together the children measured the ingredients using basic mathematics skills, hand-eye coordination, fine motor skills and touched upon early science by talking about the mixing process. The children recalled information about how to cook the pancakes in a frying pan, what ingredients go in and on pancakes and about flipping the pancake in the air (which was of great interest). After the pancakes were expertly cooked by Vanessa, they all tucked in. What a delicious day! For more information about this childcare centre in Sydney’s CBD and to book yourself in for a tour, head here.